I made a batch of pulled Pork Sliders and coleslaw for a Bourbon party at my buddy Dan’s house. He is the host over at Mantitlement and he threw an awesome Bourbon Party! The party was a great time and even a bit challenging as Dan turned it into a tasting contest. We arrived to find he had tasting stations set up for each of us. Each station had 4 samples along with tasting notes for each Bourbon. We then had to use our tasting skills and try to figure out which Bourbon was which. There was plenty of food at the party and Dan (or his wife Christie) even made some Bourbon-Bacon Chocolate Chip Cookies. Because every good day always ends with dessert. I was tasked to bring my pulled pork. Since there was going to be plenty of other food I decided to make pulled pork sliders and even mixed up some coleslaw to put on top. I trimmed up the pork shoulder and mixed up a spicy dry rub using Ghost Pepper Salt, which is crazy hot, so I used it sparingly. i also added garlic powder, Kosher salt, black pepper, cayenne pepper, and some brown sugar. I mixed this up to taste, so I am not sure how much I added of each spice. I set the Big Green Egg to 250 degrees and put the pork shoulder in. I left it on the Egg until it hit an internal temp of 195 degrees. That temp makes the meat just fall apart. Once I pulled the meat from the Egg, I let it rest for about 25 minutes. Resting is really a required step for any grilled or smoked meat because it lets the juices set up. It is also a good idea when you are going to “pull” the pork apart. It lets it cool off a bit. I “pull” the meat using a pair of insulated gloves, so letting it cool a bit helps. Once I had it shredded up to my liking, I added some BBQ sauce. I mixed two kinds together. The pork then gets mixed up and its ready to go. Since I am a big believer that every great pulled pork sandwich is even better with coleslaw, I whipped up a batch. 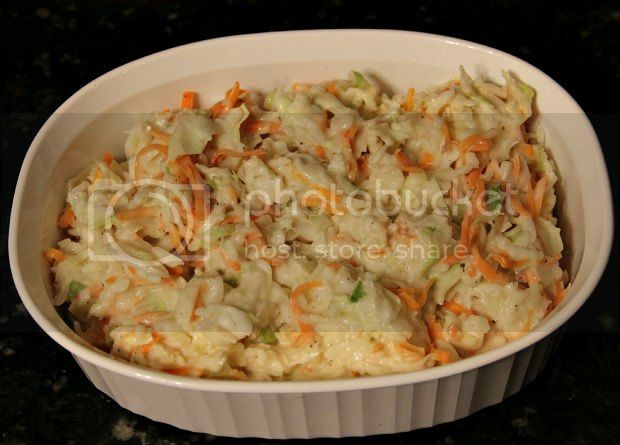 Mix together all ingredients except shredded Cole Slaw mix. Add the shredded Cole Slaw mix and stir. This is such a great recipe- Christie buys Open Pit all the time- we love to use that as a mix-in sauce too. Thanks again for everything! Chris! I’m so happy to hear how awesome the bourbon party was. When I told James about it, he was incredibly jealous. The pulled pork and coleslaw look fantastic – I have only one bit of feedback. Now that Stubb’s is available nationwide, what on earth are you doing using any BBQ sauce but that?! It’s so much better than any of the others. They even have injectable marinades now. The Texas Butter will kill you dead, it’s so good. Amber, I was at the store and saw the Masterpiece and Open Pit. I used to use those two all the time many years ago, before the BBQ sauce selection got so diverse. They are pretty good mixed together. I grabbed them to go back to my “old standard” mix. While it has been many years since I used Open Pit, I do not remember it being so thin? I have used Stubbs, but not recently. I will take your advice and try it again. My main BBQ sauce is Sweet Baby Rays. Since I always use a dry rub, and since that dry rub is normally on the pretty hot side, a sweeter BBQ sauce complements it nicely. As for the Bourbon party, we are already talking about having another one. It was a blast! James would have loved it.